Verified Sourcing Areas (VSAs) is a new area-based mechanism to accelerate production and uptake of sustainable commodities globally. It helps companies source large volumes of commodities in line with their sustainability commitments at a competitive scale and price. Through VSAs, entire production areas can be connected to global markets. In these areas, local actors drive sustainable development and receive direct support and incentives by global markets for doing so. VSAs reward the sustainability of whole regions and have impact on multiple sustainability targets at once. IDH is currently piloting VSAs in jurisdictions in Brazil and Indonesia. Watch the animation and explore the concept further below. Sustainability commitments are topping the agendas of supply chain actors. Yet no efficient and inexpensive option currently exists to guarantee supply of commodities that fulfil these commitments at scale. 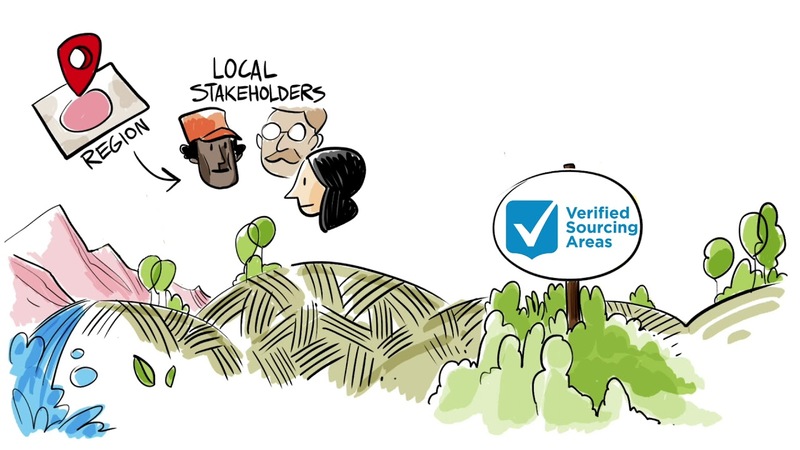 IDH and partners are now developing a new market mechanism that allows sourcing from sustainable landscapes: Verified Sourcing Areas (VSAs). Traders, processors, consumer-facing companies, producers and governments all have made commitments on sustainable production of commodities such as soy, palm oil, rubber, and beef. Certification schemes and frontrunner companies are leading in sustainability, but struggle to reach critical mass at the same time, and haven’t got public-private partnership tools available to reach their goals more efficiently. Without critical mass, the world is failing to turn the tide on issues of global concern such as deforestation and poor labor conditions. VSAs address exactly these issues: providing large volumes of commodities in line with sustainability commitments at a competitive scale and price, while lifting the base level of sustainability in producing regions. The objective is to verify the sustainability of an entire jurisdiction (e.g. municipality or district and later province and state), so it’s no longer necessary to verify each producer, mill or commodity individually. This way, sustainability targets related to forest and peat protection, labor, land tenure, governance and transparency can be much more ambitious in scale and impact. In the producing region, a sustainability improvement deal is made between private, public and civil society stakeholders at jurisdictional level, e.g. a municipality, district or province (the Compact). The Compact details priority sustainability topics, targets and responsibilities, seeking to make best use of the strengths of each of the partners involved. The Compact has a mandatory core: the global VSA performance standard, which in current draft covers five key themes of global concern: forest and peat protection, good governance, labor, land tenure and transparency. In the VSA model, any buyer, trader or interested third party will be able to easily assess the producing region’s status and progress on key sustainability targets. This way, committed end-buyers can get a better understanding of the products in their supply chain and improve sustainability with direct support for the producing region. The VSA model proposes a mainstream solution for sustainability. Through VSAs, entire production areas can be connected to global markets. In these areas, local actors drive sustainable development and receive direct support and incentives by global markets for doing so. Successful and promising VSAs will attract more buyers and financiers by making it easier to verify products. This will ultimately lead to better market conditions for producers in these VSAs. Developing the VSA Performance Standard identifying the themes, detailing those in terms of scope and indicators, engaging key stakeholders in the development process. Carrying out VSA readiness pilot projects to test the approach on the ground and ensure the Performance Standard gives the right incentives, delivers on commitments and is realistic. Currently there are VSA readiness pilots in Brazil and Indonesia, with more to come. Setting up the monitoring and verification system, ensuring transparency and trust of key stakeholders.